Today’s Veterinary Practice “How I Treat” column is based on the popular How I Treat sessions presented at the annual NAVC Conference (now VMX) in Orlando, Florida (navc.com/conference). This column features interviews with leading veterinary specialists on pertinent clinical topics, with the goal of bringing practitioners essential information on therapeutic approaches. In this “How I Treat” column, Elisa Mazzaferro, DVM, PhD, DACVECC, answers our questions on diagnosing and treating pneumothorax. Q. What are the most common causes and clinical signs of pneumothorax? A. The most common cause of pneumothorax is trauma, either from interaction with a moving vehicle, a kick by a large animal, or penetrating injuries into the thorax, including bite wounds or impalement. A less common cause of pneumothorax is spontaneous pneumothorax, which I have seen months after thoracic trauma and pulmonary contusions. 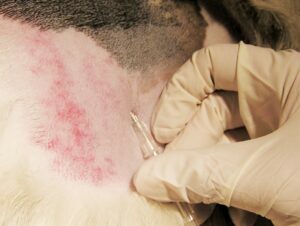 This can result from migration of foreign bodies, such as grass awns and porcupine quills, or from rupture of diseased lung tissue (bullae, blebs, pneumonic lesions, or neoplasia). Most cases of spontaneous pneumothorax are idiopathic. Clinical signs of pneumothorax include a rapid and shallow restrictive respiratory pattern, cyanotic or muddy mucus membranes, increased respiratory effort/orthopnea, inappetence, and weakness. In some cases, a pet may breathe with its head and neck extended and with elbows abducted away from the body wall. Q. What are the most appropriate diagnostic steps in a suspected case, and what test results would you expect? A. When an animal presents with a history of trauma and there is an index of suspicion for pneumothorax, careful observation and a physical examination with an eye to the clinical signs mentioned above are the best initial diagnostic tests. Auscultation of the thorax will reveal muffled lung sounds. Although air usually rises to the dorsal portion of the thorax and fluid is ventral, auscultation of all areas bilaterally is necessary. Thoracocentesis (Box 1) can be both diagnostic and therapeutic. If auscultation of the thorax is equivocal, lateral and dorsoventral thoracic radiographs can be obtained to look for free air within the pleural space. Radiography should only be performed if it does not cause undue stress for the patient. A lateral thoracic radiograph of an animal with pneumothorax (Figure 1) will show that the heart is elevated away from the sternum, and the lungs will appear retracted away from the spine, ventral body wall, and diaphragm. On the dorsoventral radiograph, lung(s) will appear retracted from the lateral body wall. In animals that are hypovolemic secondary to trauma or hemorrhage from some other cause, the heart can appear elevated away from the sternum on the lateral view, but the caudal vena cava will be small. With pneumothorax alone, the caudal vena cava will appear normal in size. On the dorsoventral view, with hypovolemia, small pulmonary vessels can be traced to the level of the diaphragm. Figure 1. 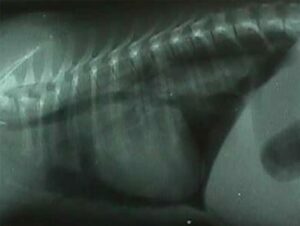 Lateral thoracic radiograph of a dog with pneumothorax. Step 1. Envision the ribcage as a box, then clip a square in the center of the box. Most texts say to tap air dorsally and to tap fluid ventrally; however, I’ve seen instances where needles are inserted too high on the thoracic wall and hit the epaxial muscles, resulting in an unsuccessful attempt at withdrawing air. Step 2. Aseptically scrub the clipped area with chlorhexidine and sterile water or isopropyl alcohol (Figure A). While the patient is being clipped and scrubbed, prepare the extension set, 3-way stopcock, and syringe (Figure B). FIGURE A Scrub the clipped area with chlorhexidine and sterile water or isopropyl alcohol. FIGURE B Supplies needed to perform thoracocentesis. Step 3. 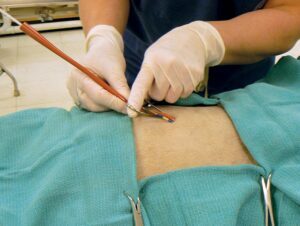 Wearing nonsterile gloves, visualize the bevel (open portion) of the needle and point the bevel ventrally. Insert the needle into the center of the box, perpendicular through the skin into the pleural space. If there is doubt about whether the pleural space has been entered, a drop of sterile saline can be placed in the hub of the needle. The fluid will be drawn into the needle once the needle penetrates the pleural space (Figure C). FIGURE C The fluid is drawn into the needle once the needle penetrates the pleural space. that the needle is directed parallel with the thoracic wall, to avoid iatrogenic puncture or laceration of the lung (Figure D). The air should be evacuated until negative pressure is obtained. In some instances, sweeping the hub of the catheter and the needle around like the hands of a clock can help in hitting various air pockets without the need for reinsertion of the needle. FIGURE D The hub of the needle should be pushed down to avoid iatrogenic puncture or lung laceration. Step 5. Once negative pressure has been obtained, repeat the process on the contralateral side, in the event that the mediastinum does not communicate. If negative pressure cannot be obtained, or if air reaccumulates more than twice, a thoracostomy tube can be inserted. Q. What short and long-term treatment options exist for this condition? A. The treatment for pneumothorax typically involves performing thoracocentesis (Box 1). 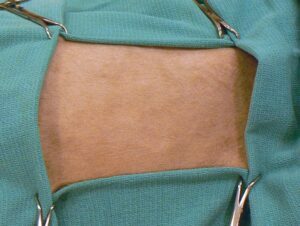 In some cases, placement of a thoracostomy tube may be necessary (Box 2). 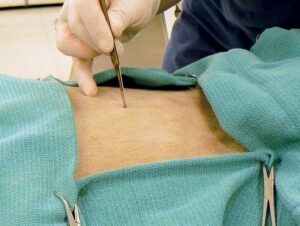 If there is an obvious penetrating wound into the thorax, you must first create a seal from the external environment and the pleural space to prevent ongoing suction of air into the thorax. First, clip and aseptically scrub the lateral thoracic wall as indicated for placement of a thoracostomy tube (Box 2). Place sterile lubricant or triple antibiotic ointment around the penetrating injury (Figure 2). Figure 2. Place sterile lubricant or triple antibiotic ointment around the penetrating injury. 3. Wearing sterile gloves and using sterile instruments, cut a sterile glove and place it over the wound and sterile lubricant. 4. Place a thoracostomy tube, then bandage as described in Box 2. 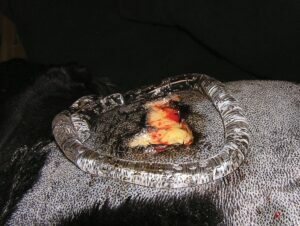 The penetrating wound can be surgically repaired once the patient’s hemodynamic status has been stabilized. Most cases of traumatic pneumothorax seal themselves within several days without surgical intervention. Cases of spontaneous pneumothorax are more challenging. It is often unknown if one isolated area of abnormal pulmonary parenchyma is leaking air, or if multiple blebs or bullae (essentially, air bubbles) have leaked to cause the pneumothorax. Performing a computed tomography scan can sometimes determine whether there is isolated versus diffuse disease; however, the most sensitive method of evaluating the lungs for abnormalities is a diagnostic and therapeutic thoracotomy. During the thoracotomy, abnormal areas of lung can be removed to prevent further leakage of air. Prognosis in cases of spontaneous pneumothorax is more guarded, as some animals, particularly Siberian Huskies, can develop progressive recurrent disease for unknown reasons. If surgical thoracotomy is not financially possible, blood patch pleurodesis can be performed instead. 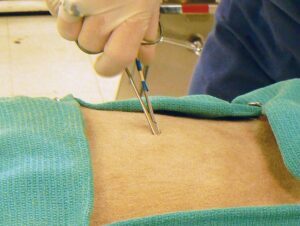 Blood patch pleurodesis involves obtaining fresh blood from the patient’s jugular vein in aliquots of 20–50 mL, for a total volume of 5–10 mL/kg. 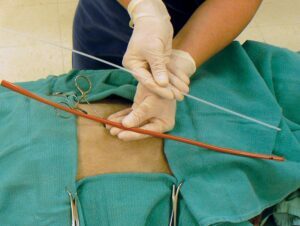 The blood is then inserted directly into the patient’s thorax using a 22-gauge needle or over-the-needle catheter. A retrospective study using this technique was successful in more than 50% of patients treated. Step 1. Clip the entire lateral thorax from dorsal to ventral, and caudally from the last rib cranial to the third rib. Step 2. Aseptically scrub the clipped area using chlorhexidine and sterile water or isopropyl alcohol (Figure A). FIGURE A Use chlorhexidine and sterile water or isopropyl alcohol to scrub clipped area. Step 3. Wearing sterile gloves, drape the clipped area with sterile field towels and secure with towel clamps. Step 4. Make a small stab incision in the dorsal thoracic wall at the 10th intercostal space (Figure B). FIGURE B Make a small stab incision in the dorsal thoracic wall at the 10th intercostal space. Step 5. Have an assistant pull the skin cranially and ventrally toward the elbow to help create a tunnel of skin. Step 6. When the hole is over the 7th or 8th intercostal space, insert a hemostat forceps through the hole and through the subcutaneous tissues. Using blunt dissection, make a stab through the intercostal muscles into the thorax. Avoid the caudal aspect of each rib, where the intercostal vessels are located (Figure C). FIGURE C Using blunt dissection, make a stab through the intercostal muscles into the thorax. Step 7. 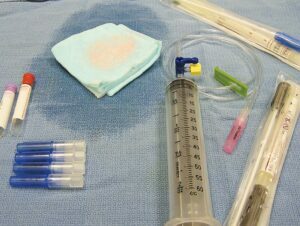 Insert a rigid, sterile polypropylene urinary catheter through the red rubber catheter to make it more rigid (Figure D). Keep the hemostat open and push the red rubber catheter through the hemostat into the thorax, directing the tube cranioventrally, such that the tip sits at the 3rd to 5th intercostal space (Figure E). FIGURE D Insert a rigid, sterile polypropylene urinary catheter through the red rubber catheter to make it more rigid. FIGURE E Push the red rubber catheter through the hemostat into the thorax, directing the tube cranioventrally, such that the tip sits at the 3rd to 5th intercostal space. Step 8. Attach the Christmas tree adapter, 3-way stopcock, IV extension tubing, and 60-mL syringe. Have an assistant withdraw air from the pleural space. Step 9. Suture the tube in place using first a horizontal mattress suture, then a purse-string suture around the tube. 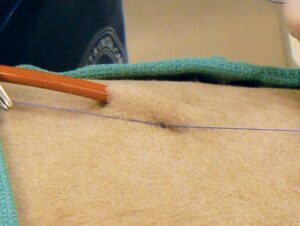 Once the purse-string is attached, secure with a finger-trap suture (Figure F). FIGURE F Once the purse-string is attached, secure with a finger-trap suture. Step 10. Secure the tube and Christmas tree adapter to the extension tubing and a 3-way stopcock using the 22-gauge orthopedic wire. Step 11. Bandage the thoracostomy tube. The tube can be used for intermittent suction as needed or connected to a continuous suction device for constant evacuation of air from the thorax. Q. What are the most important prognostic factors to consider in cases with pneumothorax? A. 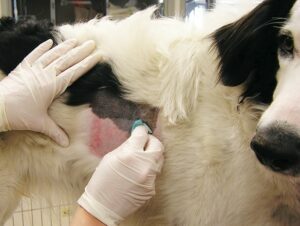 Most animals with traumatic pneumothorax have a generally good prognosis with appropriate care. However, they often have concurrent trauma-related injuries that can adversely affect outcome. This includes the degree of hypovolemic shock and the patient’s response to therapy, as well as the presence of traumatic brain injury and orthopedic injuries. These sometimes lead to euthanasia if the prognosis for return to function is poor. Dr. Mazzaferro is a graduate of Michigan State University College of Veterinary Medicine and completed an internship at the Veterinary Institute of Trauma in Wisconsin. She then completed a residency and earned a PhD in emergency–critical care at Colorado State University. She is currently is a staff criticalist at Cornell University Veterinary Specialists in Stamford, Connecticut, and an Adjunct Associate Clinical Professor of Emergency and Critical Care at Cornell University College of Veterinary Medicine. She is President of the American College of Veterinary Emergency & Critical Care and has authored/edited 4 books and numerous manuscripts related to fluid therapy, emergency procedures, emergency and critical care, and other related topics. She lectures extensively nationally and internationally, speaking in more than 21 states and 9 countries.